PA leaders urge France to move forward with its peace initiative despite Israel’s rejection of it. Palestinian Authority (PA) leaders on Monday urged France to move forward with its peace initiative despite Israel’s rejection of it. Palestine Liberation Organization (PLO) Executive Committee secretary Saeb Erekat said in a statement that the meeting between France’s special envoy, Pierre Vimont, and PA chairman Mahmoud Abbas was a positive one. 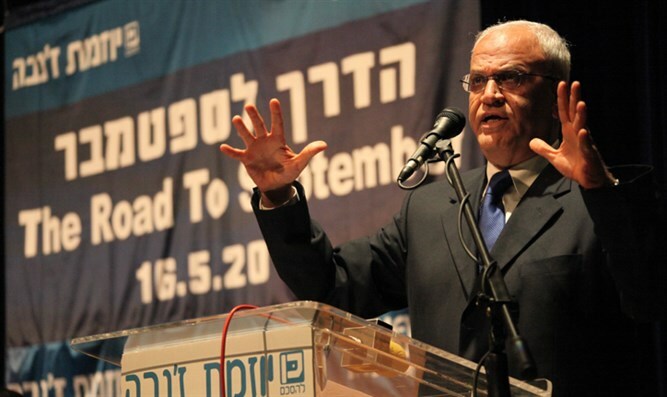 Erekat added in the statement, quoted by the Palestine News Network, “We have encouraged France to go ahead with its initiative and supported its efforts to have a conference before the end of the year. He pointed out that Israel should not be given the chance to sabotage such an international initiative. Abbas spokesman Nabil Abu Rudeineh confirmed that the Palestinian position is to support the French peace initiative, no matter if Israel approved it or rejected it. Earlier on Monday, Israeli officials meeting with French envoy Pierre Vimont reiterated Israel’s firm opposition to France’s initiative which aims to convene an international peace conference by the end of the year. Israel insists that the only way to achieve peace is through direct talks with the PA, but the PA refuses direct talks and imposes preconditions on them. Despite Israel’s rejection of the initiative, French officials told Haaretz later on Monday that the country will not stop trying to promote its initiative. "The negative Israeli response was predictable, and we will take Israel's position into consideration. However, we plan to carry on promoting our peace initiative," the officials stressed. Despite the fact that it supports the French initiative, the PA has continued to seek an alternative in case the United States may seek to modify it – namely in the form of a Security Council resolution condemning Israeli “settlements”.